It is no doubt that there are numerous tweaks available in Cydia to modify the look and feel of your iPhone, iPod Touch or iPad. Examples of these tweaks would be Springtomize 2 that allows you to more subtly change the look and feel of your iOS device or even theming platforms like WinterBoard that dramatically change the GUI (graphical user interface) of your iOS device. Now, it looks like we will have another tweak joining the ranks, and this time it comes from a well-known tweak developer who goes by the name of FilippoBiga. You see, FlippoBiga has recently tweeted about a new Cydia tweak he is developing dubbed WallpaperLog. 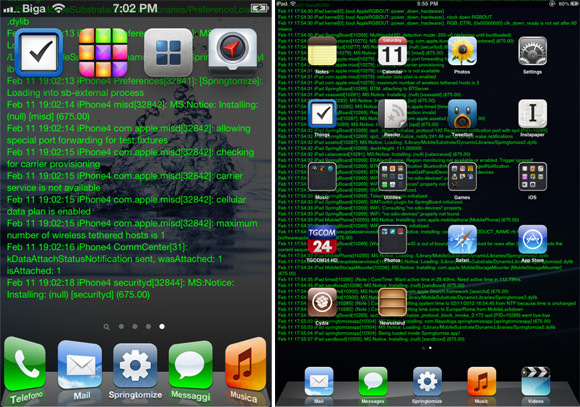 What the WallpaperLog Cydia tweak will do is actually put an active console log as the background for your iPhone, iPod Touch or iPad. Obviously this Cydia tweak is purely for aesthetic purposes, and will most likely only gravitate towards the geekier bunch. It is, however, still worth talking about as it will be released for FREE into Cydia in the very near future. is there any scrolling functionality? and will it keep logs of general UI alterations or actual system info?